A site plan approved in 2015 shows the residential portion HHHunt purchased to the south. 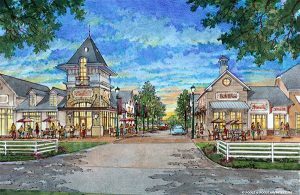 A portion of a stalled mixed-use development near Mechanicsville is moving forward after getting picked up by one of the Richmond area’s biggest homebuilders. 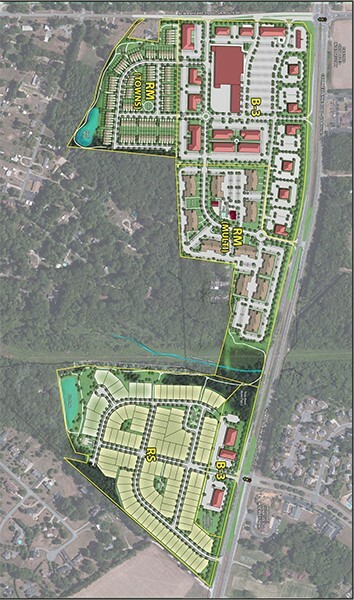 HHHunt Communities has purchased about 48 acres that make up the southernmost portion of Caldwell Park, a 120-acre mixed-use development planned along the west side of Chamberlayne Road south of New Ashcake Road. HHHunt purchased the land for $4.39 million in a multiparcel deal that closed Aug. 3, according to the Hanover County Assessor’s Office. The land is zoned for 115 single-family home lots on about 32 acres, with about 5 acres of commercial development fronting Chamberlayne/Route 301. Plans submitted for a recent project update to the county planning commission indicate HHHunt plans to maintain those numbers. It purchased the parcels from Kirby Cove Family LP, which had owned about 31 of the acres since 1995, and from Caldwell Residential LLC, which purchased the remaining 17 acres in August 2017 for $1.3 million, county property records show. Caldwell Residential LLC is owned by business partners Richard Hollins and Dennis Young, who own the nearby Atlee Auto Service repair shop. They also own a nearly 23-acre parcel in Caldwell Park’s commercial section, closer to the intersection of Chamberlayne and New Ashcake. Hollins and Young purchased that parcel in December 2016 for $907,419 from Scotchtown Partners LLC, the entity through which Caldwell Park originally was proposed in 2015 by Edge Development Partners. That group secured zoning for the project to allow for 115 single-family homes, 131 townhomes, 286 apartments and 200,000 square feet of commercial space. At the time, the group was aiming to start construction in late 2016. 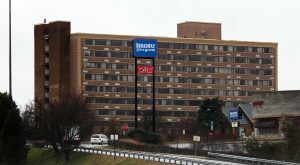 But by the end of that year, it had sold its ownership stake in the project when it sold its parcel to Hollins and Young. Jesse Clark, a principal with Edge Development along with Nolan Felts and Craig Kilpatrick, would not discuss the ownership changes or current status of the project, but said the group remains involved as consultants on some portions. Young said he and Hollins had been following Caldwell Park through the rezoning process and were supportive of the project when an opportunity arose to buy into it. He said they were also landowners for Marley Pointe, a townhome development behind Atlee Auto Service that likewise involved Edge Development and HHHunt. While supporting the project, Young said he and Hollins are not driving Caldwell Park’s development. 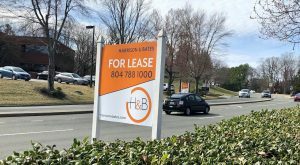 He said there is currently no movement on the commercial and multifamily portions, which, in addition to their parcel, consist of land owned by two other parties – listed in property records as Mary Lynne McDougle and Rachel Huff. 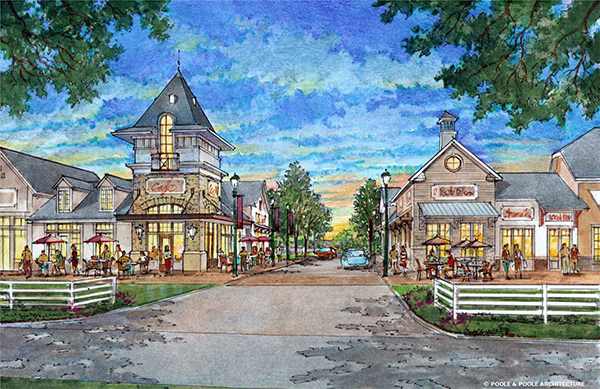 A rendering of the rural village concept previously envisioned for the mixed-use portion of the project. While the bulk of the project at Chamberlayne and New Ashcake was envisioned with a “rural village” concept, the southernmost portion that HHHunt will develop is detached from the rest, separated by Totopotomoy Creek. When the project was approved three years ago, Edge Development said the single-family homes would range from 2,200 to 3,000 square feet with price tags ranging from the low $300,000s to $500,000. It wasn’t clear last week whether HHHunt’s homes will fall within those numbers. 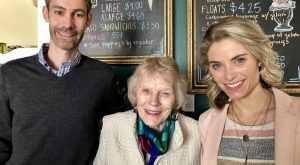 Jonathan Ridout, HHHunt’s vice president for land development, said the project, to be called “Southerly at Caldwell Park,” will consist of 115 detached houses built by HHHunt Homes and CraftMaster Homes. He did not specify plans for the commercial portion along Chamberlayne. Ridout said the neighborhood will be “designed to complement the eventual commercial, multifamily and townhome sections of” Caldwell Park. Plans for the neighborhood include open spaces, tree-lined streets, paved walking trails and a pavilion overlooking a pond. Site work is slated to start early next year, with home construction getting underway next fall, Ridout said. 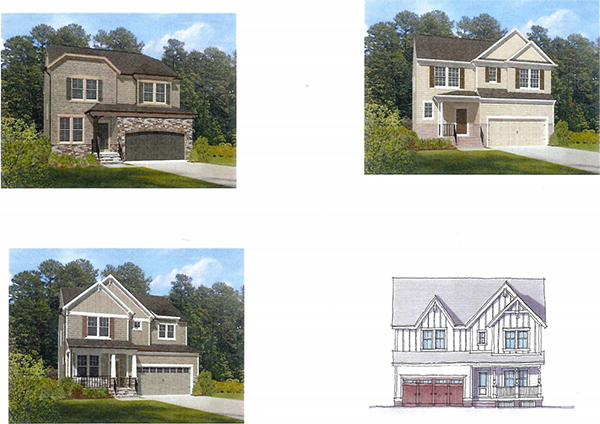 Sample homes HHHunt plans to build at Caldwell Park. HHHunt is working on the project with Henrico-based Bowman Consulting, which is handling engineering and surveying work. Meanwhile, HHHunt has its hands full with other developments around Richmond. The company, responsible for such master-planned communities as Wyndham, Wellesley, Twin Hickory and Charter Colony, currently is developing River Mill, a 1,000-home community near Virginia Center Commons. It received zoning approval this year for a 520-home, age-restricted development in Goochland County. 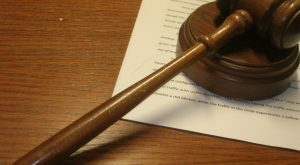 The company also is renewing its legal fight with Henrico County over a contested connector road between Wyndham and an adjacent development planned across the county line in Hanover. 5 Comments on "HHHunt buys into stalled mixed-use project"
Hope this helps get the whole project off and going. It is such a nice idea for this area of the county. I do wonder why they chose “Southerly” as the name. If I remember correctly, Caldwell is supposed to be an english themed development. Ivy meadows or something “english” would have fit better than southerly. Yeah dude, great idea. Let’s keep jamming up the 301/Atlee Station corridor with traffic and suburban sprawl. I was happy when this fell through the first time. As a Hanover native, I’m getting sick of these builders and investors destroying the counties rural beauty only to huge profit for themselves and cause headaches for the tax paying citizens. Hanover lost its rural charm when I was a kid (early 80s), if not before. Is blaming developers fair here? It took another “native Hanoverian” to sell the land in the first place. 301 is easy driving compared to 360 and most all other major corridors in the region. I do not care for sprawl either, bur No locality can too much about it. Promoting density and mass transit could certainly happen at the regional/state/federal level to help out, though. Somebody should post this on a billboard next to the Tea Party signs haha!